Dolphins have long impressed people with their sharp minds and humanlike traits, such as calling each other by name, goofing off and even understanding numbers. Now a scientist has found that the mammals can recognize an old friend’s whistle, even after they have been apart for 20 years — the longest social memory ever recorded for a non-human. 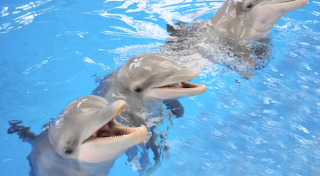 In a study released Tuesday, dolphins largely ignored calls from unfamiliar dolphins but responded when an old tank mate’s signature whistle was played back to them. It didn’t matter how much time had passed since the two had last seen each other or whether they had been tank mates for only a few months: The dolphins appeared to remember a familiar whistle.